No this is not The Onion. 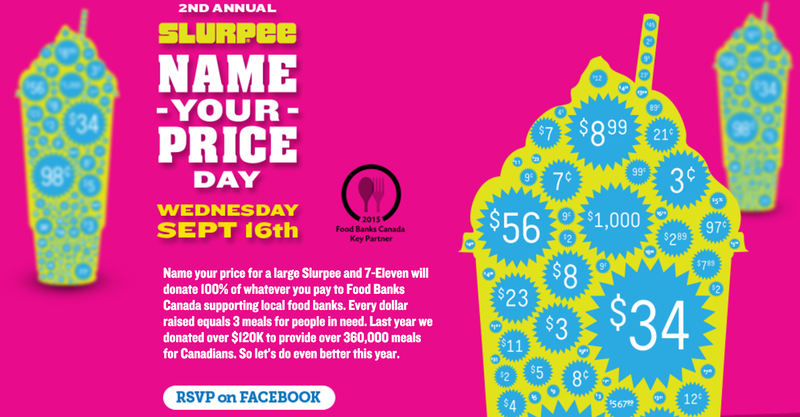 In the Bizarro world we've created, where selling illness to fund charity is totally normal, the fact that Food Banks Canada has elected to partner with 7-11 and sell "Name Your Price Day" large sized Slurpees to raise money to fight food insecurity won't bat many eyelashes. A large Slurpee is 28oz (828ml), and if you order the Dr. Pepper flavour (that's the one I would have ordered if I were a kid), your large's 525 calories will come from the 3/4 of a cup of sugar (36 teaspoons) it'll contain. For 7-11, this is killer marketing. Water and sugar cost them virtually nothing. 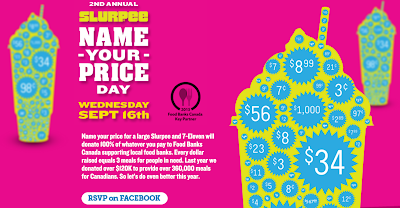 7-11 generates tremendous brand goodwill, gets huge social media marketing via the public's sharing of the day's event, draws huge numbers of customers through the door, and rather than you getting a tax receipt for a charitable donation, they get one - and I'm betting it'll more than cover the cost of the day's Slurpees. There's no doubt that the practice of junkfood fundraising with sugar-sweetened beverages (where I'm betting a huge percentage of those taking advantage of 7-11's Name Your Price larges will be children) will one day end, but that day won't come until the general public recognizes just how backwards these cause-washing initiatives are in the context of health. Food Banks Canada should know better.